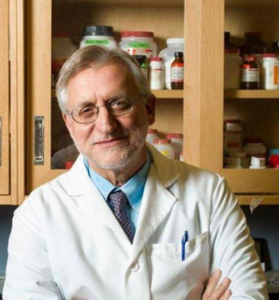 Theoharis Theoharides, PhD, MD is Professor of Pharmacology and Internal Medicine, as well as Director of Molecular Immunopharmacology and Drug Discovery, in the Department of Immunology at Tufts University School of Medicine, Boston, MA. He received all his degrees with Honors from Yale University and was awarded the Dean’s Research Award and the Winternitz Prize in Pathology. He trained in internal medicine at New England Medical Center. He first showed that mast cells, known for causing allergic reactions, are critical for inflammation, especially in the brain, and are involved in a number of inflammatory conditions that worsen by stress such as allergies, asthma, eczema, psoriasis, migraines, multiple sclerosis and most recently autism spectrum disorder. He has shown that corticotropin-releasing hormone (CRH), neurotensin and substance P, peptides secreted under stress, act together, and with the cytokine IL-33, to trigger mast cells and microglia to secrete inflammatory molecules. These processes are inhibited by the novel flavonoids, luteolin, and tetramethoxyluteolin that he has helped formulate in unique dietary supplements and a skin lotion. He has published over 400 scientific papers and 3 textbooks with 30,501 citations, and he is in the top 5% of authors most cited in pharmacological and immunological journals. He has received 37 patents and trademarks, including three patents covering the use of luteolin in brain inflammation and autism.